This short from Keystone is the first Gloria Swanson movie I’ve reviewed for this blog. It’s probably not the sort of thing most people think of when they think of Gloria, but it does demonstrate her versatility and comfort in front of the camera. 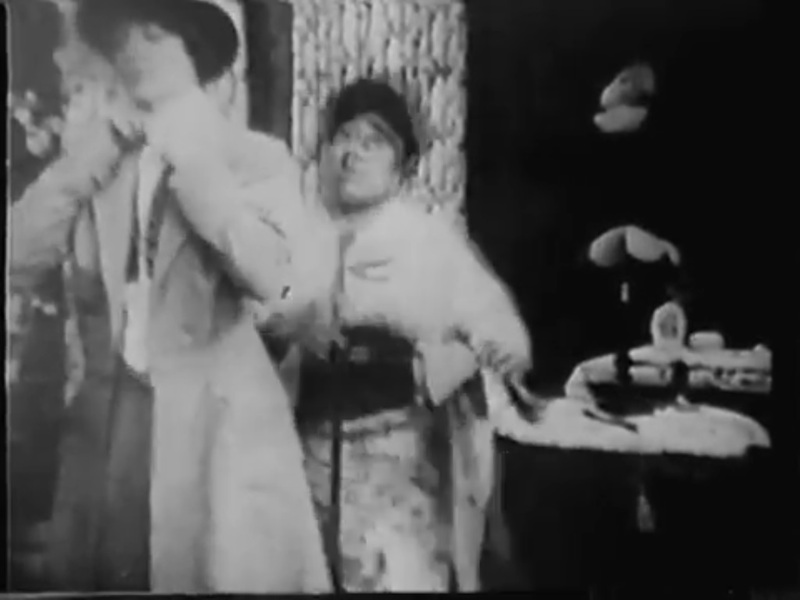 The movie begins with a quarrel between Myrtle Lind and Bobby Vernon. Myrtle’s in a rather unflattering Mary Pickford-style wig, which I guess signals us that she’s a “good” girl. Bobby quickly falls into the orbit of “bad” girl Helen Bray, who may be deliberately imitating (or parodying) Theda Bara’s performance in “A Fool There Was.” She’s going riding, and invites Bobby along after brushing off “Last Season’s Suitor” (A. Edward Sutherland). Gloria shows up driving recklessly with her brother Reggie Morris (for some reason known throughout as “Honey Boy”). Reggie is hoping to hook up with the danger girl, and Gloria develops an interest in Bobby when he helps her change a tire. When all the men start gravitating to the danger girl at a party, Gloria decides to take matters into her own hands by dressing as a man and distracting her. Myrtle ends up with Reggie, once the danger girl is no longer in play, but Gloria has to avoid the attacks of Last Season’s Suitor until Bobby drives a bus through the plate-glass window of the café they’re at and rescues her. Finally, all the “good” people are happily paired up. This movie is a bit hard to keep up with, in part because the prints I was able to find were of poor quality, so it’s hard to tell actors apart, but in part because the characters don’t have enough personality or back story to identify with. The danger girl is distinctive, and once Gloria’s in her masculine attire, she’s easy to track, but the others seem quite interchangeable. I’m still not 100% sure I kept the division between Myrtle and Gloria straight before the “drag” sequence, and I gave up even trying to tell Reggie from Last Year’s Suitor, although Bobby Vernon is generally recognizable. 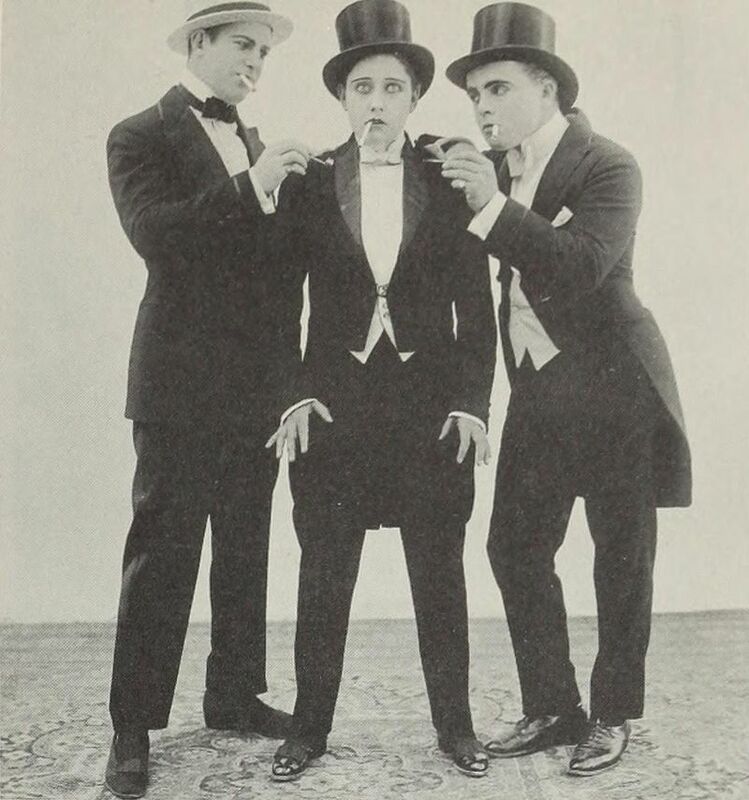 For a Keystone comedy, I was a bit surprised at the “adult” approach to comedy for the first two-thirds of the movie, although once we get to the café the Mack Sennett chaos does kick into gear. The theme of women in “masculine” attire goes a bit beyond just the explicit drag sequence: the danger girl’s riding outfit includes pants and a blazer, giving her a “hard” look, and Gloria puts on overalls when she has to work on her car. I suspect this was titillating to a 1916 audience, who didn’t often see women in pants. Some of the most interesting scenes involve Gloria in the “male” domain of a saloon, where she has to figure out how to stand at the bar, and avoid being groped by a fat drunk. We do get some basic camera movement and reasonably sophisticated editing, certainly if one compares this to the Keystone Chaplins of 1914, but it was hardly cutting-edge in production values. This one is a bit tricky, like you said, to keep everyone straight. However, I liked some of the sight gags & thought Gloria Swanson was fab. She definitely pulls it off. All the more impressive, considering she was still a teenager.